Mokosh is a Russian brand of high quality jacquard wraps and Amata, who runs the business, draws on a lot of natural and folk references for the interesting and often intricate designs. I’m a bit of a fan so was pleased to get the opportunity to review a wrap. Ayiri is a geometric, intertwining pattern of zig-zags and uses complementing and contrasting colours to create an almost 3D/Escher effect; it’s very striking and works well when the wrap is gathered/drawn across the body. The colours of Sea Island are sandy/golden yellows/teal, accented with black and white so it has an autumnal/harvest look to it. Both sides of the wrap are equally beautiful. Like all Ayiri, the wrap is made from 100% cotton and weighs approximately 260g/qm. The weave is close (I wouldn’t worry about pulls), has a very good diagonal stretch, is textured and feels airy. It came to me mostly broken in though I’d say it was likely manageable to work with from its first wash. I suppose I had expected something slightly more beastly as I’m used to the extremes of either wrapping with kitten-belly-soft cashmere/silk or taming grippy tussah/cotton; this feels very much a middle ground. This work-woman never blames her tools so I write my review with a caveat. The wrap’s arrival coincided with possibly the grumpiest 8 month old wrappee and therefore the most hasty/lazy of wrappers. Mathilda, my wrappee, is going through a week or so of developmental funk so was less smiley and patient than usual. Therefore, I was more rushed with my wrapping; not that I profess to have amazing wrapping skills. This caveat made, I can heartily say the wrap more than stood up to my slapdash testing. 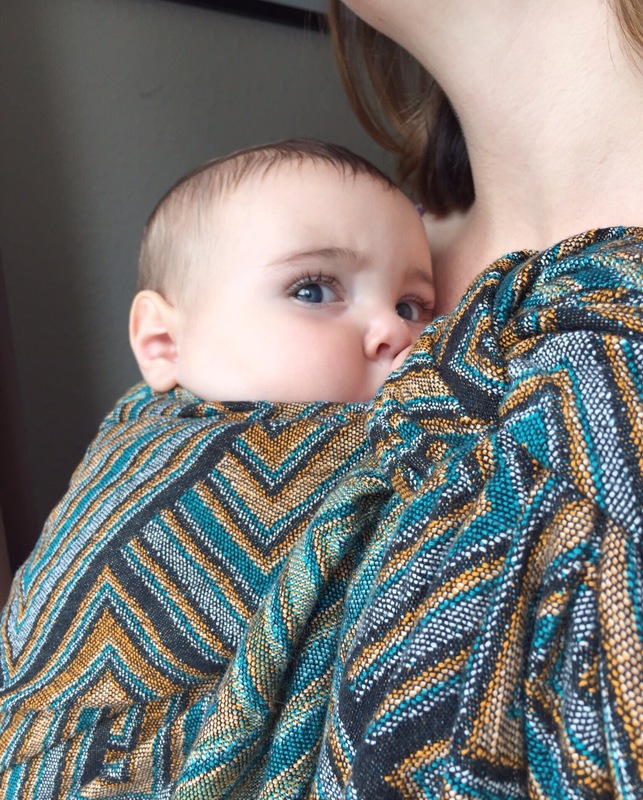 Despite my initial hesitancy on how the new, all cotton, wrap would be to work with I was pleasantly surprised. My wrappee is preferring lots of gazing time at the moment so the week has been spent mostly experimenting with hip and occasional front carries. The wrap works well, the passes glide smoothly, it drapes beautifully and the result doesn’t budge an inch. Ayiri gathers, knots and slip-knots well so finishes don’t feel too bulky and awkward but carries were easy to adjust. As my wrappee was less settled I was truly grateful for the way carries held in place even with an occasional droopy rail or saggy shoulder. 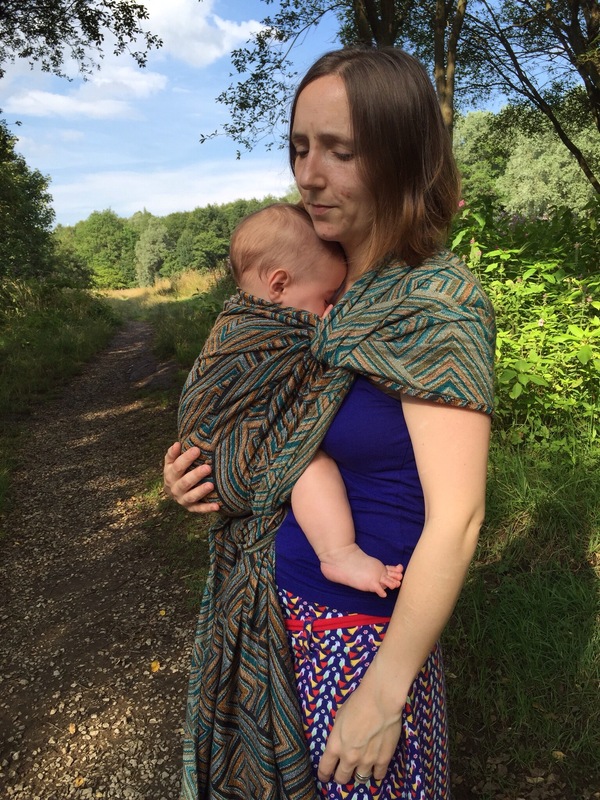 We went on several long walks and, particularly in a multi layer carry, the wrap was comfortable and supportive with no annoying digginess. Despite several typically British muggy days, when there’s not a chance I’d use a multi layered carry, I never felt hot and flustered using the wrap. I’d recommend this wrap as an easy-care workhorse; one that you’d reach for throughout the year; but I bet it’ll glow this coming autumn.